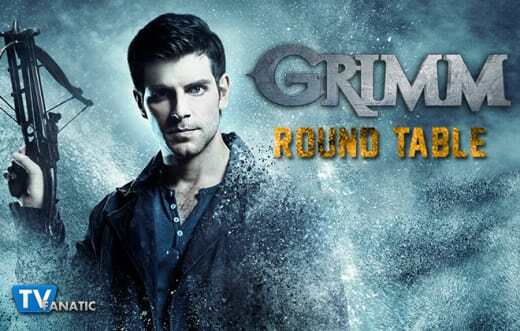 Welcome to the very first Grimm Round Table! This week on the NBC drama, Monroe's fate hung in the balance as Nick and his team frantically searched for him after he was kidnapped by Wesenrein fanatics intent on executing the Blutbad for marrying outside his race. Grimm Season 4 Episode 10 dramatically concluded the Wesenrein storyline, while continuing other long-term plot threads, notably Juliette's little Hexenbiesting issue and Sergeant Wu's wide-eyed entrance into his new reality. Join TV Fanatic Round Table Panelists Doug Wolfe, Robin Harry, Allison Nichols, and Kathleen Wiedel as they dive into this exciting, plot-driven episode and discuss some of the major developments that they saw brewing – and be sure to add your own thoughts and answers in the comments section below! 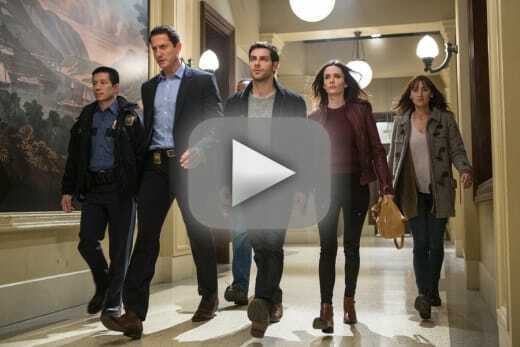 Grimm has always tried to find a balance between "case of the week" episodes and more serialized storytelling. What do you think about this, especially in terms of this week's episode? Doug: I actually like the season arc episodes more than the “case of the week” deals. This one was especially interesting and engaging. Robin: I think that they've done a much better job in the past season of balancing the two. In the past few seasons, the story arcs tended to drag along. This season, though, they've picked up the pace with the story progression. This episode was a perfect example of how they finally got the pacing right, with a timely end to the Wesenrein story, and a steady movement of the Juliette Hexenbiest story. Allison: I agree with Robin. This season has done a better job with the ongoing story arcs that would just drag on and get boring. I definitely prefer the more serialized storytelling, and it is often better when there isn’t a case of the week that takes up space. Kathleen: A satisfying conclusion makes one forgive a lot of slogging build-up, doesn't it? "Tribunal" was such a fantastic episode that I'm almost willing to forget how long they dragged out Wu's introduction to the team, for instance. One of the dangers with serialized storytelling is that they're in constant danger of dragging on, as Allison suggested, if plot developments don't proceed apace. I totally enjoy long-term story arcs, of course, but I also think "case of the week" stories have their place. Juliette's now a Hexenbiest, and it's only getting worse for her. What do you think about this storyline so far? Doug: It increases her value to the series, I think. Up until now she’s been the whiny sort of hanger-on – just there to provide a small amount of conflict for Nick. I’m glad they’re past that – and now that we know that the kind of Hexenbiest that are made are actually more dangerous than those who are born that way makes her even more interesting. When they went into battle against the Wesenrein and lost her gun, I fully expected her to use her new powers and was glad when she did. Robin: I'm excited about it, and I think it's the best storyline Juliette's been given in the entire show. I think it remains to be seen whether it's getting "worse" or "better" for her, since we're not sure how she's going to deal with it. She's obviously disturbed by what's happening to her, but she didn't seem to have a problem with it when it came in handy with the Wesenrein. Allison: I’m intrigued. Hopefully this will mean interesting things about her character. I look forward to seeing Renard try to help her out. It will be interesting to see how Nick reacts to the news. I don’t think he is going to try to kill her like the preview suggested. Kathleen: Yeah, those previews really annoyed me, because there is absolutely no way that Nick is actually going to kill Juliette over this. That said, I don't think he's going to react very well when he does find out. (Would you, if your significant other suddenly became a rotting corpse-witch?) Yet another reason to hate Adalind, I suppose. As Doug pointed out, this storyline gives Juliette the opportunity to be more to the series than "Nick's girlfriend" and to empower the character. I've always wanted to like Juliette, but the writers made it so hard to do so up to this point. And then I watch this episode and want to tell them, "This! We need more of this Juliette!" Any thoughts now that Sergeant Wu has finally been brought into the group? Doug: Talk about an overlong arc on that one! The only thing I thought when they first came clean with him was “it’s about time”. I mean come on – they let the guy hang out in a mental hospital all because they were afraid to tell him the truth? Robin: It's about time! I've always thought that Wu was an underutilized character. I think it's great that he's now fully on the team, I love how he's embraced it, and I'm looking forward to getting a lot more Wu-snark in each episode. Allison: I feel like this should have happened forever ago. There were so many episodes where I was yelling at the TV to just tell him already. I’m glad he is in the know, although he seems a little obsessed with Wesen. I mean, he goes to Nick’s trailer and brings junk food to just camp out and study. Kathleen: Sergeant Wu's introduction into the Wide World of Wesen seemed to drag on and on. He was attacked by the Aswang in Grimm Season 3 Episode 14, "Mommy Dearest," which first aired all the way back in March 2014! It just seemed very frustrating as an audience member for it to take so long for Nick and company to tell him the truth. In any event, it's a great relief that they've finally brought him in on this – and, like Robin, I'm definitely looking forward to more Wu-snark in the coming episodes! When Grimm first started, it was pretty much Nick stumbling around in the dark on his own (with occasional help from Monroe). What do you think of how things have evolved since then? Doug: It’s a well-oiled machine now. I just wish Hank would stand back and let Nick go full fury on one of the bad guys. Just once. Robin: He got way more than "occasional help;" Monroe practically carried him through the first year or so. Nick has really come into his own, but he also has a great team of people supporting him. It was great watching this episode where he had to rely on his police work more than his Wesen friends to save Monroe. Allison: I’ve enjoyed the team dynamic that has formed. Nick has a variety of people that he can turn to. I do miss Monroe and Nick just going out and handling the case on their own at times. The issue of when Nick should just go full Grimm and when he needs to be a cop is still blurry. I’m not sure if there will ever be a clear answer to it. Kathleen: While there's something to be said for the sort of buddy-cop thing that Nick and Monroe had going in Season 1, I like how the writers have been willing to let things grow and change over time and not get stuck in a stagnant status quo. Each new member of Nick's team has brought his or her own unique flavor and storylines, and while it's been occasionally frustrating (see: Juliette), I am very excited at where they are now and where they're going in the future. Another series that has evolved in this same manner is Arrow, which started with Ollie on his one-man mission to save Starling City and has since become so much more than that with the gradual additions to his team. What scenes or quotes stood out for you? Doug: I’m so used to seeing Rosalee in her Fuschsbau state as timid and afraid. It was so good to see her so fierce and ready to rip throats out when she woged after seeing Monroe about to be killed. Robin: The Wesenrein massacre. 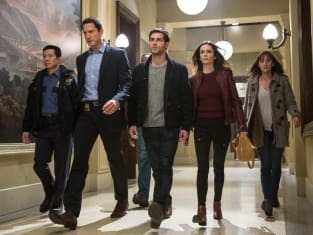 It was a fantastic climax to an intense episode, which showed off the badassery of all of team Grimm, but was still appropriately disturbing, keeping in line with the subject matter. Watching Monroe and Rosalee go at that guy's neck seriously creeped me out, but it was still somehow appropriate and powerful. Allison: I loved Monroe’s speech to the Wesenrein after he has been sentenced to death. He talks about how life isn’t pure – it’s messy. I just loved anytime Monroe talked back at the tribunal. Also, Budd sticking up for Nick was all sorts of fantastic. Kathleen: All the scenes you guys mentioned were fantastic, but I have to say that I absolutely loved it when Nick and the rest of his team (which will now be known in my mind as "The Awesome Posse") heroically rounded the corner on their way out of the precinct to save Monroe. NOTE: Grimm Season 4 Episode 11 will be titled "Death Do Us" and air on Friday, January 30. Hank: Want to get a couple of things clear first. Wu: "First"? There's a second? Permalink: "First"? There's a second? Wu: And by "ready," you mean "off the deep end"? Hank: There is no shallow end in this pool. Permalink: There is no shallow end in this pool.